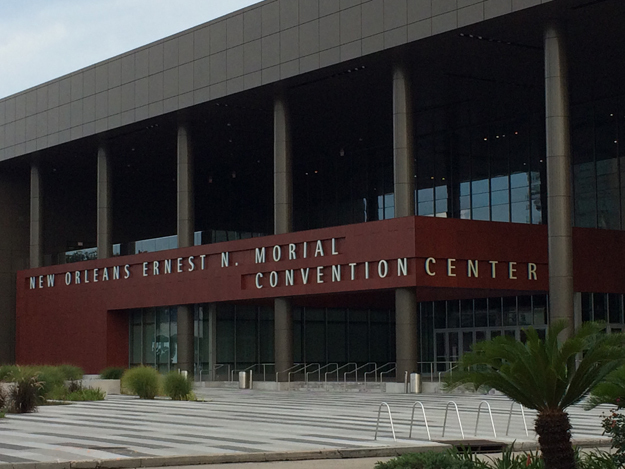 Erroll Williams, the Orleans Parish tax assessor, is complicating plans for a hotel that officials of the Ernest N. Morial Convention Center want to build with tens of millions of dollars in taxpayer subsidies. Williams told Convention Center officials during a meeting last month that he doesn’t see how the hotel would be exempt from paying property taxes — as the officials are seeking under a novel financing scheme. Melvin Rodrigue, the Convention Center board chairman; Michael Sawaya, the center’s president and general manager; and an attorney representing the center met with Williams on Feb. 15 to explain their proposed hotel deal. The meeting occurred three weeks after some Convention Center board members expressed doubt that moving forward with the hotel would be possible without the property tax exemption. Sawaya declined to respond to Williams’ comments. Local hotel owner Joe Jaeger Jr., who would play a role in developing the hotel, said he would not question whatever Williams decides. “He’s logical, he’s open-minded, and he’s fair, even if we didn’t get our way,” Jaeger said, adding that he believes Williams might come to another conclusion once he has more information. Jaeger was not present for the February meeting. As the parish assessor, Williams determines whether a property qualifies to be exempt from taxes. However, a property owner can sue to overturn a ruling by Williams, who was one of the city’s seven assessors from 1985 until 2011, when he became the sole citywide assessor. Convention Center officials say the development would qualify for a property tax exemption because they would create a structure in which a nonprofit called Provident Resources Group would own the hotel. The property tax exemption would be worth an estimated $2 million per year in current dollars over the next 40 years, under the proposed financing scheme. Convention Center officials are seeking to build a 1,200-room Omni hotel that would be developed by Texas-based Matthews Southwest Hospitality, Jaeger and another prominent New Orleans developer, Darryl Berger. Matthews Southwest and the two men would receive development fees for their roles. The hotel would cost $558 million and would be located at the upriver end of the Convention Center on 8.1 acres owned by the center, which is a state entity. It would feature ground-floor retail and 150,000 square feet of ballroom and meeting space. A consultant’s study says the hotel would bring 40 additional events per year to the upriver end of the exhibition hall, which is often vacant, and would expand the city’s hotel capacity for big events such as the Super Bowl and major conventions. Officials believe it also would spur residential and commercial development on 39 adjacent acres owned by the Convention Center that are vacant today. Convention Center officials and the hotel developers had hoped to nail down the specifics of the deal in July, but questions about the financing — and the size of the public subsidy — have stalled the project. She made her comments a month after the nonpartisan Bureau of Governmental Research found that the taxpayer subsidies would amount to $330 million in today’s dollars. “The proposed deal would involve, by far, the largest contribution to a real estate project involving a private developer in recent memory in New Orleans,” BGR said in a 16-page report released in July. The Convention Center countered that the taxpayer subsidies would amount to only $171 million. The only way to get the hotel built, according to its proponents, is with hefty subsidies from the Convention Center and various exemptions from local taxes. The proposed deal calls for $41 million in upfront cash from the Convention Center, a free 50-year land lease with four optional 10-year extensions, and a 40-year break on property taxes. It also would include complete rebates of a 10 percent hotel-occupancy tax and a 4 percent sales tax on all hotel revenue from sources other than room rentals. Besides the $330 million value identified by BGR, the proposed plan also calls for other subsidies from the Convention Center: $26 million to perform “site prep” to remediate any hazardous soil and to install utilities on the site, and $20 million to connect the hotel to the Convention Center at Henderson Street. Tom Morsch, a consultant hired by the Convention Center from Hotel Asset Value Enhancement, told Convention Center board members on Feb. 27 that the various subsidies are needed because convention center hotels are inherently uncertain ventures. In an interview, Williams repeated comments he had made to The Advocate in November. He said his focus is not on any larger goals but only to determine whether the law allows the hotel to qualify for the requested tax exemption. He said he could not give a definitive opinion until officials have provided the hotel’s final financing plan, something he doesn’t expect for at least another two years. It would be tax-exempt if the Convention Center itself financed the hotel, he said, but that is not the current plan. Williams said he also isn’t inclined to grant a property tax exemption sought by officials at the National World War II Museum for the hotel they are building across Magazine Street from the museum. The officials say the hotel would be an “educational” facility, according to Williams. No one from the museum was available for comment. Williams said a tax exemption for the Convention Center hotel would be unfair to nearby hotels that pay property taxes, although he said center officials have told him that the Greater New Orleans Hotel & Lodging Association supports the concept. Mavis Early, the group’s executive director, did not respond to two emails seeking to confirm this. Asked for a response to Williams’ comments, Sawaya first requested questions in writing to “give us time to research and respond in writing.” After he received a dozen questions in an email, he then said it would not be “prudent” to discuss details of the project at this time. On Feb. 27, investment banker Keith Butler asked the Convention Center board to consider his proposal to have the center finance the deal, which he said would be cheaper thanks to a lower interest rate available to it. But the board rejected even authorizing its outside financial consultant to meet with Butler to discuss his idea. Sawaya said the Convention Center would not have the capacity to finance the hotel itself.